BOSTON (AP) — Alex Cora knows first-hand the way things change in October. That’s why the Boston Red Sox manager wants to keep everything the same for his club. They will enter the American League Division Series on Friday with two AL MVP candidates in Mookie Betts and J.D. Martinez, plus Cy Young Award candidate Chris Sale and former Cy Young winners David Price and Rick Porcello — both coming off solid regular seasons. The Red Sox won’t have an ALDS opponent until Wednesday when the Yankees host the Athletics in the wild-card game. Cora said the team will gather for dinner that night and watch together. Other than that, their preparations will be the same — from meetings, to batting practices, to bullpen sessions. “That’s why I feel they’re gonna be fine, because nothing’s gonna change,” Cora said. Under Cora, the Red Sox have become an aggressive offensive team with dependable power in the middle of the lineup — two of their biggest deficiencies over the last two postseasons. 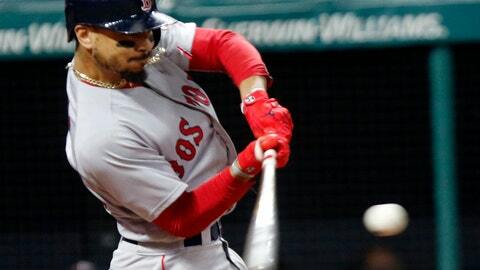 And according to the Elias Sports Bureau, Betts and Martinez became the first MLB teammates to finish first and second in batting average and slugging percentage since 1904, when Pittsburgh’s Honus Wagner and Fred Clarke did it. Boston won its regular-season series with the Yankees 10-9, but went just 2-4 against Oakland. The Athletics’ Sean Manaea no-hit Boston in April, though he’s now out for the season with an injury. “The team that wins,” he said. Notes: Cora said right-hander Nathan Eovaldi is in line to start Game 4 of the ALDS if they face the Yankees. He said lefty Eduardo Rodriguez would start that game if they face the Athletics. But he said both decisions are not set in stone. Chris Sale, David Price and Rick Porcello have been named as starters in the first three games.